One of our loyal PhoneArena readers has sent us Verizon promotional material for the soon-to-be-unveiled Motorola DROID Turbo 2 and Motorola DROID MAXX 2. This information shows what the Motorola DROID lineup will look like following Tuesday's unveiling, consisting of the Motorola DROID Turbo 2, Motorola DROID Turbo and the Motorola DROID MAXX 2. Based on the leak, it appears that Verizon will be keeping the OG DROID Turbo around as a lower-priced option for subscribers. It also reveals that a 25W charger will be in the box of the DROID Turbo 2, able to give users 13 hours of battery life after a 15-minute charge. The 21MP rear camera will feature zero shutter lag and offers Rapid focus. There will be 32GB and 64GB variations of the device. The 64GB model is available only from the Moto Maker site, and includes the ability to refresh the design within two-years. More details about this feature will be made known on Tuesday. Most of the other specs are already known, such as the 5.4-inch screen with a 1440 x 2560 resolution, and the Snapdragon 810 CPU. The latter comes with an octa-core 2GHz CPU and the Adreno 430 GPU. A 2TB capacity microSD slot is on board. The DROID MAXX 2 offers a 5.5-inch screen with a 1080 x 1920 resolution. A Snapdragon 617 SoC is under the hood, equipped with an octa-core 1.8GHz CPU. 16GB of internal storage is inside, along with a 128GB capacity microSD slot. The camera combo from back to front weights in at 21MP/5MP. DROID MAXX 2 owners will receive one free screen repair for two years from the time the phone is purchased. We will know everything, including pricing and availability, when Motorola and Verizon hold their media event on Tuesday. Keep checking in for more leaks, rumors and news. Screw Verizon after what they did to Lumia 950 and 950xl. No matter Microsoft doesn't need their big red asses. Microsoft Microsoft Microsoft cheer with me my people. The messiah has spoken. Microshaft Micromachines Microphones! Nope, can't do it. Sorry. That Turbo 2 has some killer specs. Just wish it wasn't a Verizon exclusive, and I say that as a Verizon user. 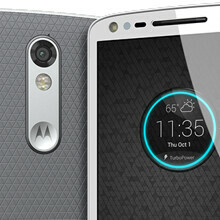 Carrier exclusive variants like this will not be supported nearly as well as global phones like the Moto X series. Original Turbo has killer specs, still a rubbish phone in my opinion unfortunately. Much worse than the Z3v I had for a week, other than maybe the camera. And yet Motorola has committed to update the Turbo to Marshmallow, but not the carrier-specific Moto X '14. If you're going to buy from Verizon and want good support, get an iPhone, a Galaxy, or the flagship Droid. Wrong. Motorola has confirmed that the Moto X 2014 on Verizon will get Marshmallow. Do your research next time. Source...? Sorry, it's just that Droid Life posted a huge rant about this subject a week ago. I think you're confusing the Moto X 2014 Pure Edition with the Verizon version. Neither the Verizon nor the AT&T versions of the Moto X 2014 are scheduled to get Marshmallow. I like what they're doing with the droid series but I'll just keep dreaming to own one as it will not come to my country. Gimme that maxx 2. Replace it with the x play any day. They're both phablets! Can we get a phone with a 4.8-5.1" screen and body dimensions below 5.5" x2.8" please?!! Some of us keep our phones in our pockets! To everyone saying that they wish the Turbo 2 was not just a Verizon exclusive, all Verizon 4G LTE phones come factory unlocked. All you have to do is change the APN settings to work on your respective carriers. It does mean buying the phone outright which can hurt your wallet, but it is possible to use it on any carrier. If the Maxx 2 can work on other carriers and is priced cheaper tahn the X Pure, I might go with that.